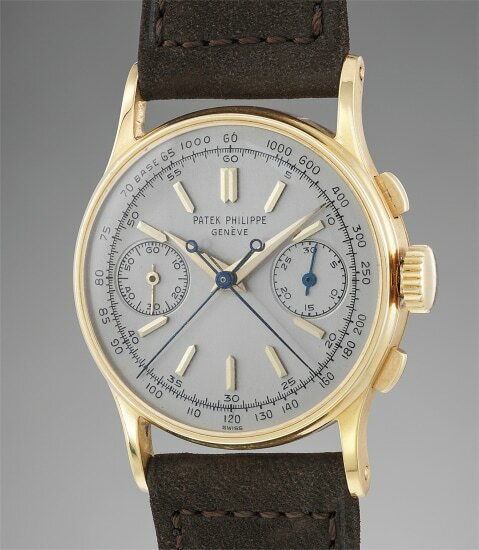 Accessories: Accompanied by Patek Philippe Extract from the Archives confirming production of the present watch with raised hour-markers in gold and tachymeter scale in 1946 and its subsequent sale on October 28, 1946. Furthermore delivered with an additional Patek Philippe silvered dial. In production for over 30 years, reference 1436 delights with its myriad of case and dial combinations. Housing a split seconds complication, the model was used to time a range of activities, from horse racing to scientific experiments. The reference can generally be divided into two series. The first, such as the present watch, featured a crown that functioned as a button to split and reunite the two chronograph seconds hands. The second generation had a co-axial push button within the crown to operate the split seconds function. This particular example cased in yellow gold is preserved in excellent condition with full and robust proportions. There is a hallmark visible on the upper right lug. This timepiece most notably features a dial with a hard enamel "short" signature that is preserved in excellent condition as well as tachymeter scales that are raised and crisp. It is possible to conclude that the previous owner most probably chose to upgrade the old dial with the present one, in order to provide a fresh and more well-preserved appearance. As an additional bonus, the present lot is accompanied by an additional silvered dial that is stamped with Stern numbers on the back.